Of all the endurance races that take place during the year, Australia’s Bathurst 12 hour has to be up there as one of the most exciting. The Mount Panorama track is as beautiful as it is treacherous: four miles long, with 570 feet being the difference between its highest and lowest point. The sometimes-public-mountain-road circuit can also be particularly narrow, demanding extreme focus from drivers looking to tackle it. Audi has had two victories here, and with seven customer cars taking to the field, they hope that there’s more to come. Under five different teams, seven Audi R8 LMS cars will be taking on the most famous track down under, battling against 22 other cars for victory. This is a race-spec version of the GT that puts out 562 horsepower from its 5.2-liter V8. “The relatively narrow track with its mix of fast and slow turns, plus many inclines, is very special and doesn’t forgive any mistakes. We need to drive with high precision because there are some sections without large run-off areas,” says Christopher Mies, who saw victory with Audi in both 2011 and 2012. This year, he joins Marc Cini and Mark Eddy at Hallmarc Racing where a third victory is perhaps coming his way. 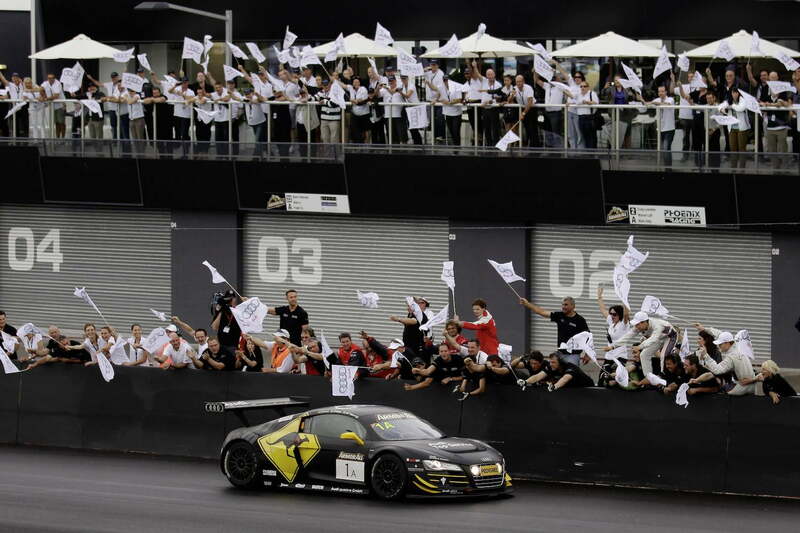 Phoenix Racing will put two R8 LMS cars on the track, with the #16 car team being led by Felix Baumgartner. If the name rings a bell, He’s the daredevil who broke the highest skydiving record in 2012, jumping out of a suborbital ballon and free-falling for 24 miles. He then joined up with Audi Motorsport and participated in the 24 Hours of Nurburgring, where his team placed 9th. The race kicks off this Sunday around 1:50 EST, if you’re in the U.S., and the main website will have a live stream going to cater to the international fans.